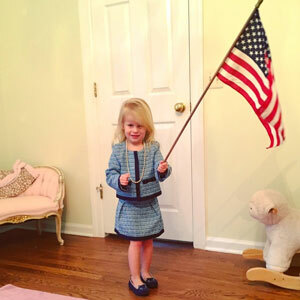 Our favorite occupation-themed Mighty Girl costumes from our own costume collection and photos of Mighty Girls in costume shared by our community! 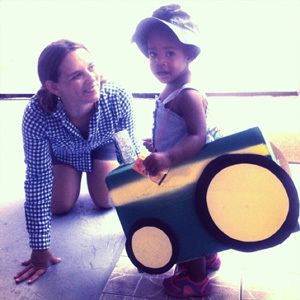 Halloween dress-up fun gives kids a wonderful opportunity to imagine themselves in any number of roles, such as pursuing a future career aspiration! Whether she sees herself as a doctor, firefighter, ballerina, or scientist, she can "try on" her dream job for a night -- and perhaps even spark an interest that will last a lifetime. 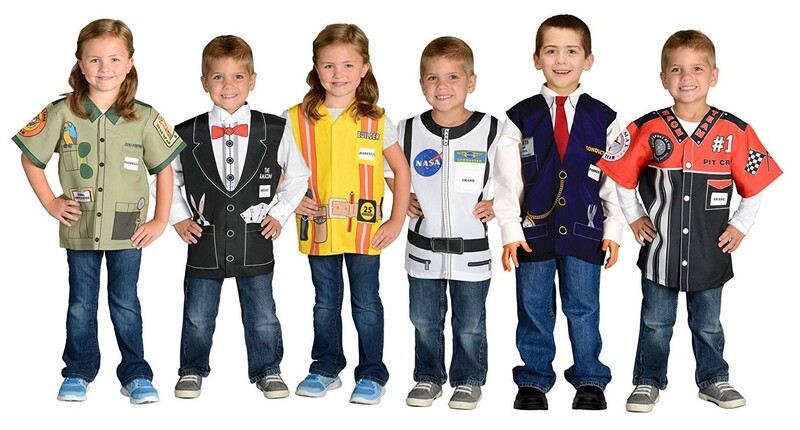 In today's blog post, we share some of our favorite occupation-themed costumes, including a number from A Mighty Girl's costume collection such as veterinarian, astronaut, and chef costumes. 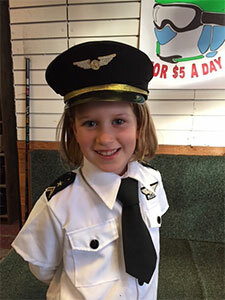 Of course, many Mighty Girls enjoy the challenge of creating their own costume, so in the second section, we highlight a few of our favorite costumes inspired by careers that community members have shared with us in previous years! Dreams are sweeter when they take you to the stars! 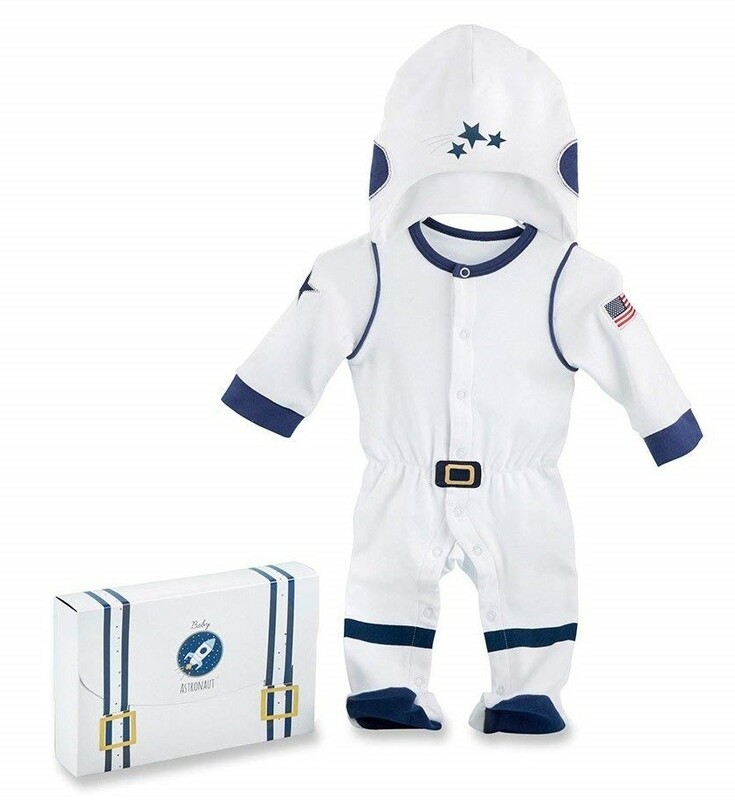 With Baby Aspen's astronaut layette set, she'll look just like a real astronaut, with a 100% cotton "uniform" bodysuit — complete with American flag patch and a black and gold belt buckle applique — and a matching helmet-style cap. Snap closures and machine washable fabric make this set easy on parents, too! Paging Dr. Baby! 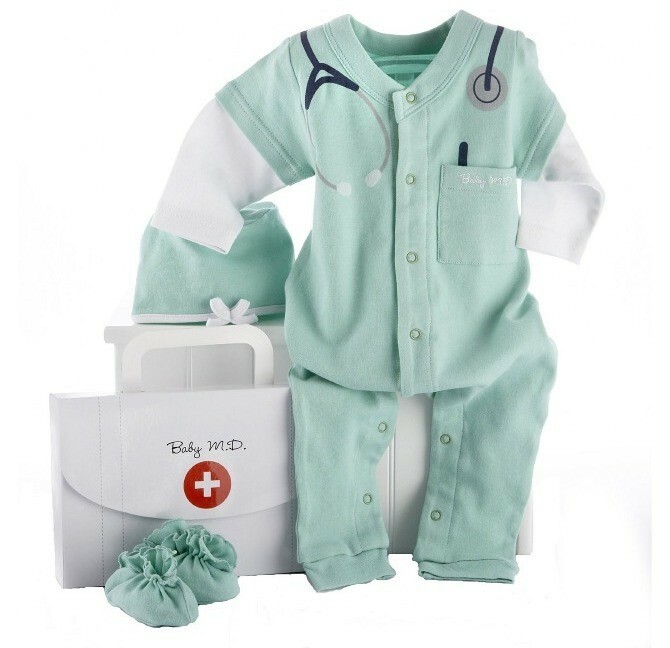 Future medical professionals will be snuggled up, comfortable and warm, in this 100% cotton layette set that looks like a doctor's uniform. The sleeper includes an embroidered stethoscope and pen detail and comes with a separate set of hospital "booties", as well as a surgical cap-style hat. It all comes in a gift box that makes it a great shower gift, as well as the perfect choice for a baby's first Halloween. If dance is in her blood, she can dress up as a ballerina for her very first Halloween with this layette set! This snuggly cotton sleeper is embellished with an organza tutu and printed ballet slipper feet, and also comes with a soft hat with ribbon trim. It’s a perfect first costume — but it also comes in a gift box, making it a great shower gift for the dancing parent-to-be in your life! 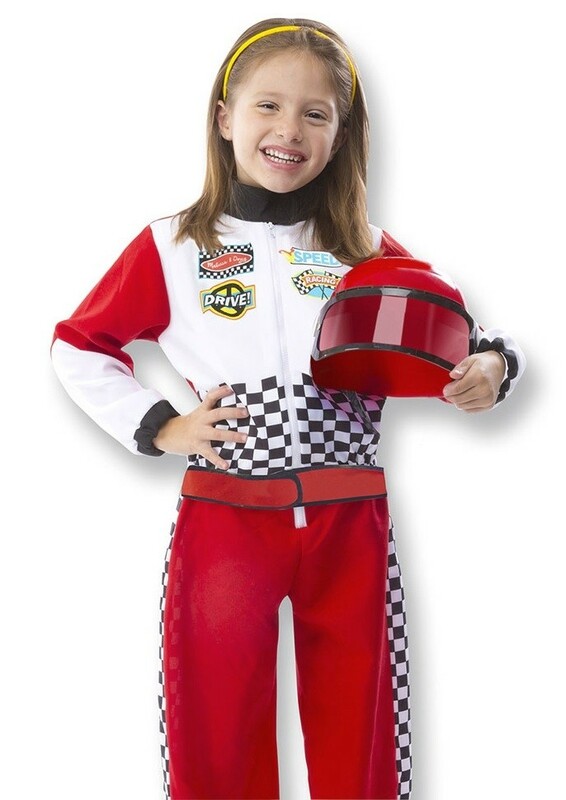 She can imagine all the things she can be with this set of career-themed dress-ups from Dexter Educational Toys! 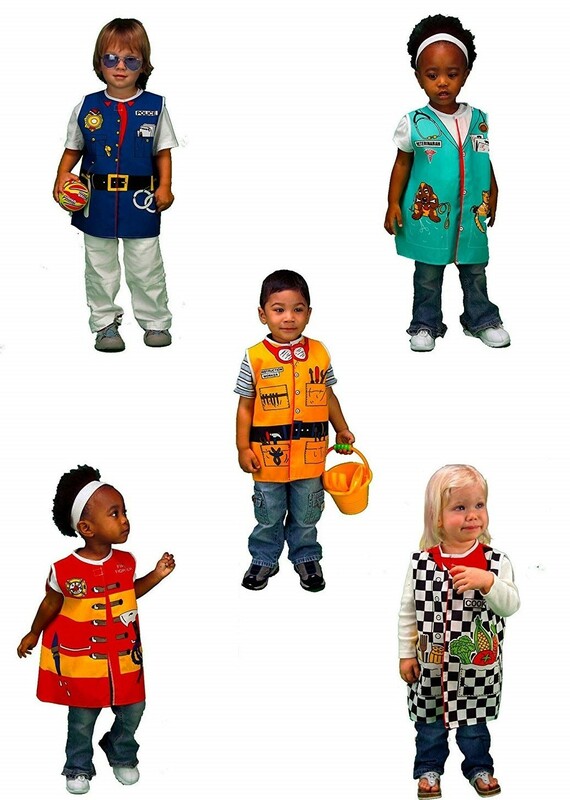 Each costume vest features a different career, including police officer, fire fighter, veterinarian, construction worker, and chef. A simple front-open design with Velcro ensures these costumes are easy to put on and move around in, for hours of fun pretend play! Neither snow nor rain nor heat nor gloom of night... Getting letters and parcels to the right people is an important task, even in this day of electronic communication. 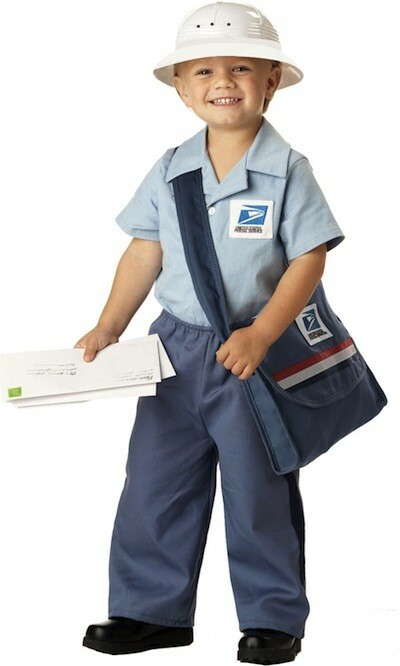 This officially licensed USPS costume allows kids to imagine themselves delivering these critical packages, either in their own neighborhood or across the country! The set comes with a shirt, pants, and a cap, all with great realistic details. When things get hot, she’s ready for action! 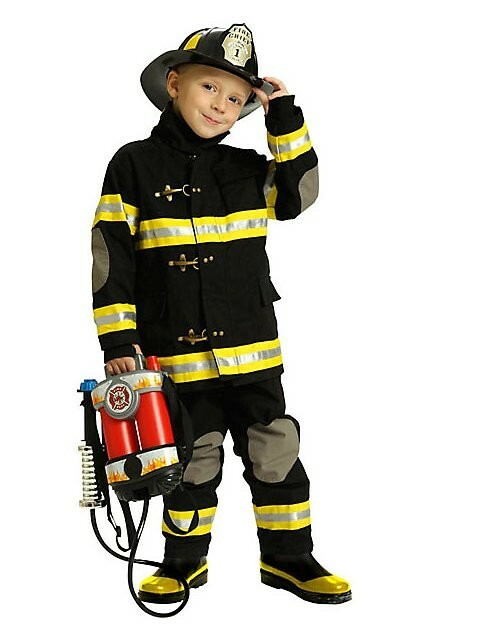 Future firefighters will love this realistic firefighter costume, which includes a rugged overcoat with gauntlets, helmet, and overalls with suspenders. There are lots of authentic details, such as reflective strips and knee and elbow patches, so this suit looks just like the ones her heroes wear every day! For a similar set, check out Melissa and Doug’s Fire Chief set for ages 3 - 6. Modern zoos aren’t just about showing people wild animals; they’re also about rehabilitation, breeding, and research. 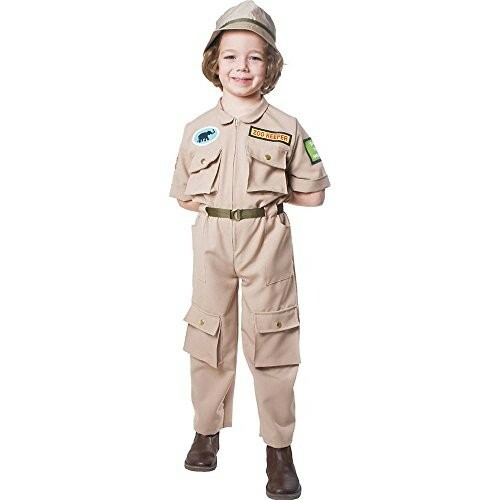 If your Mighty Girl imagines herself devoting her attention to keeping zoo animals healthy and happy, check out this zookeeper set which includes a jumpsuit with zookeeper patch, a belt, and a hat. To serve and protect: a good officer is devoted to her community! 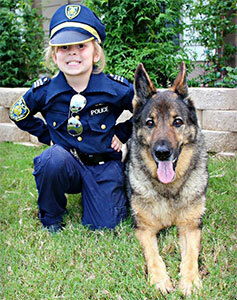 If police officers are her heroes, she can be ready to enforce the law in this realistic costume, which includes a shirt, pants, hat, whistle, and belt, all with careful detailing to make them look authentic. For another option, check out Melissa and Doug’s police officer set for ages 3 - 6. Ladies and gentlemen, this is your captain speaking! She'll be ready to take to the skies in this fun pilot roleplaying set. 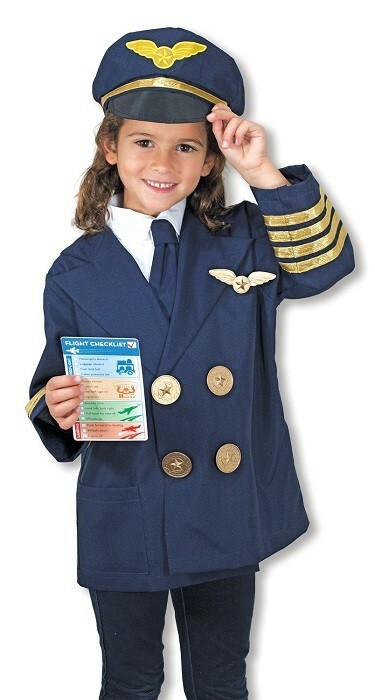 This detailed set includes a uniform jacket with a built-in shirtfront, a set of pilot's wings, a hat, a detachable necktie, a flight checklist, and even a steering yoke. It's the perfect pick for a kid who dreams of soaring through the clouds one day. She’ll be ready to take care of plenty of animals in need with this fun costume set! The set includes a jacket, face mask, and surgical cap (all machine washable), plus a stethoscope with sound effects, a syringe, a bandage, and a name tag you can personalize. 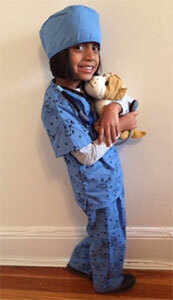 As an added bonus, a plush puppy patient comes with the costume — perfect for practicing her vet skills. 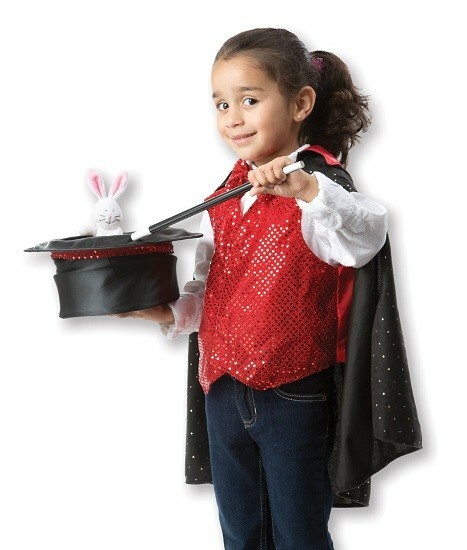 She'll astound her friends and family with her amazing tricks in this fun magician costume! This high quality costume set includes a vest, a cape with a bow tie, and a magic wand. It even comes with a few good tricks: make a coin magically appear and disappear in the vest pocket or pull a rabbit out of the included top hat. A card with some additional magic tricks will provide hours of fun for your little magician. The doctor will see you now! 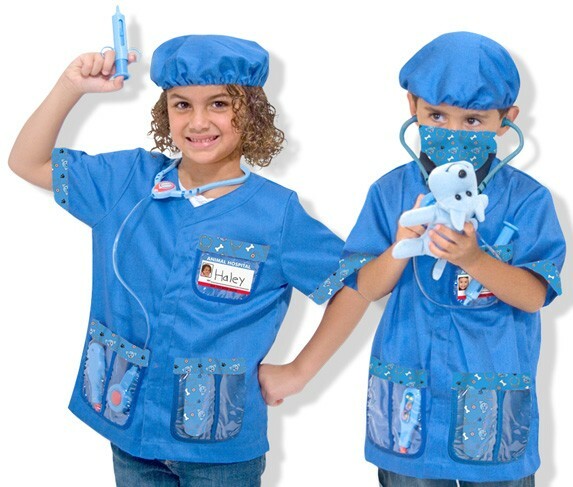 This dress-up set includes a jacket and face mask, a stethoscope with sound effects, a reflex hammer, an otoscope, a syringe, and a name tag you can personalize. 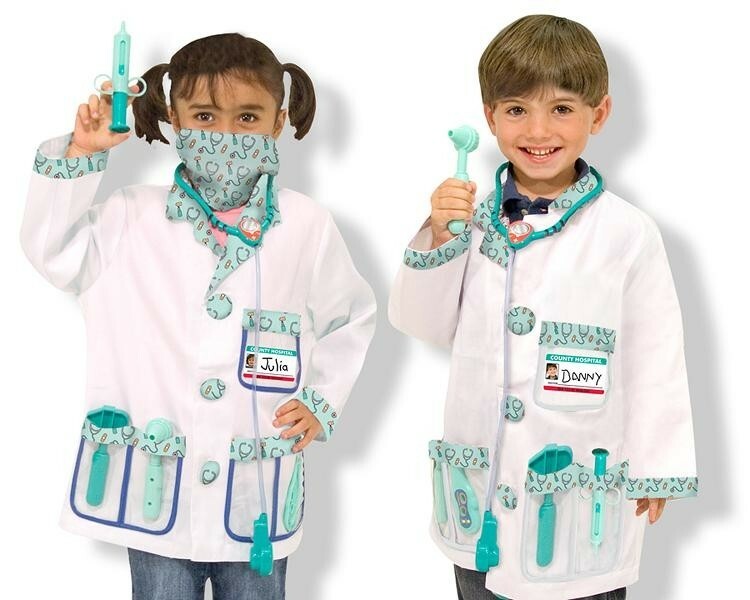 Budding doctors will love wearing this trick-or-treating or for day-to-day play. You can also check out the Baby M.D. Layette set for ages 0 - 6 months, the Surgeon Costume Set for ages 4 to 8, and, for Doc McStuffins fans, the Doc McStuffins costume for ages 3 - 8.
Who says girls don’t use power tools? 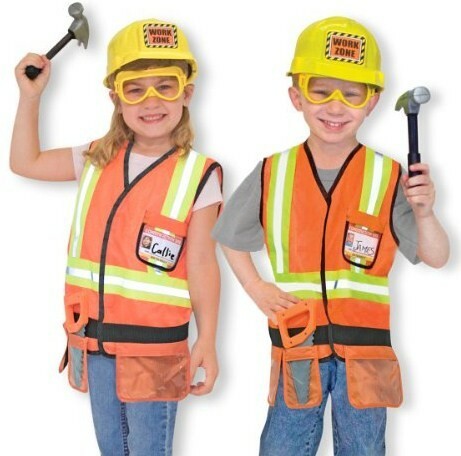 Your future contractor will love this set, which includes a hard hat, realistic work zone safety vest, tool belt, and customizable name tag. For added fun, this set comes with a pair of toy safety goggles, a toy saw, and a toy hammer — or, get a larger toy tool set like the Green Toys tool kit (ages 2 - 5) which is even made out of recycled plastic. 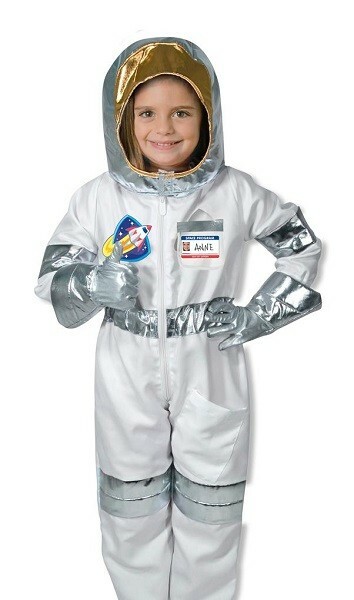 Blast off into trick or treating with this fun astronaut costume! This detailed dress-up set includes a spacesuit with a rocket ship emblem, a fabric helmet, gloves, and even a customizable name tag for your little space adventurer. While it's great for Halloween, this costume is also sturdy enough for plenty of year-round dress-up play — it's tough enough to go to Mars and back! Bon appétit! She might be the next great chef, so foster her dreams with this fun chef’s dress-up set. 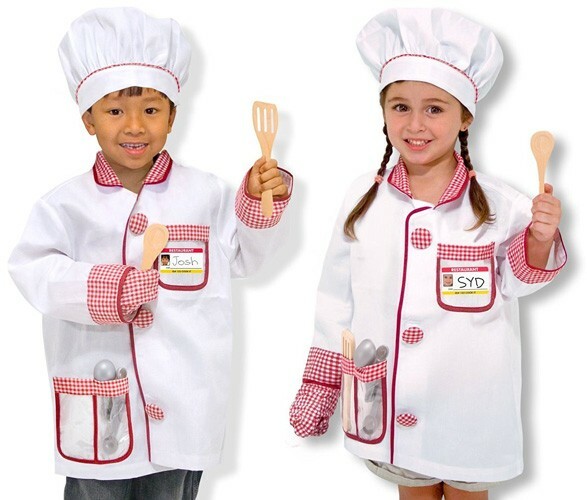 The set comes with a machine washable chef’s jacket and hat, so she can wear it in the kitchen as she learns as well as for dress-up play! Also included are a set of play measuring spoons, wooden utensils, oven mitt, and a name tag for personalizing. And if she really loves to cook, add this set of real child-sized chef’s tools. Littler Mighty Girls can opt for this Baby Chef Layette Set, which is suitable for newborn to 6 months of age. This baby needs a true professional to make sure she gets better — and now your child can be the one to do it! 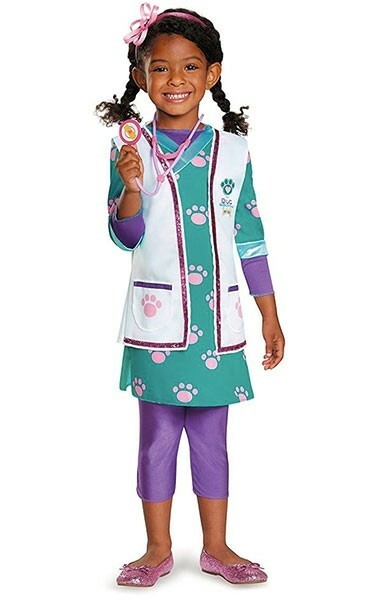 This pediatric nurse costume comes with everything she needs to dress up as one of these dedicated practitioners, from a child-friendly, gender-neutral uniform to medical tools like a stethoscope, otoscope, and thermometer to a customizable hospital ID. The set even comes with a baby doll with a removable diaper so she can practice doing a head-to-toe checkup. The train goes chugging down the track — thanks to the deft engineer at the controls! 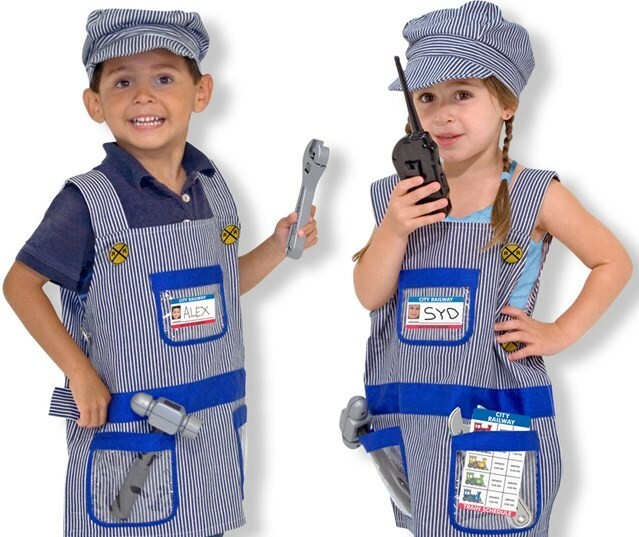 If your Mighty Girl pictures herself riding the rails as she sees people and cargo safely to their destinations, get her this engineer costume set, which includes an overall smock and a hat, as well as accessories like a train schedule, a hammer and wrench, a walkie-talkie, and a customizable name tag. Get your binoculars, your net, and your tools: there's a whole world to explore out there! 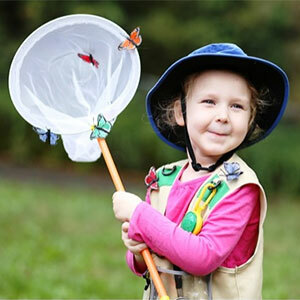 This nature explorer set is perfect for dress-up play or for actual outdoor investigation. 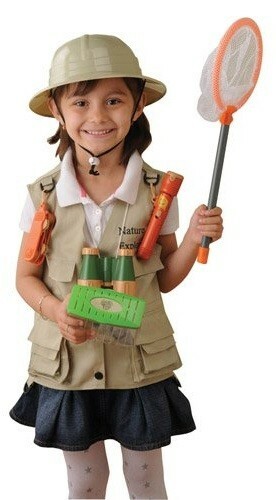 In addition to the jacket and plastic hat, this set comes with a basic set of binoculars, a mesh net, a magnifier, a bug jar, a set of tweezers, a flashlight, and a set of utility tools. 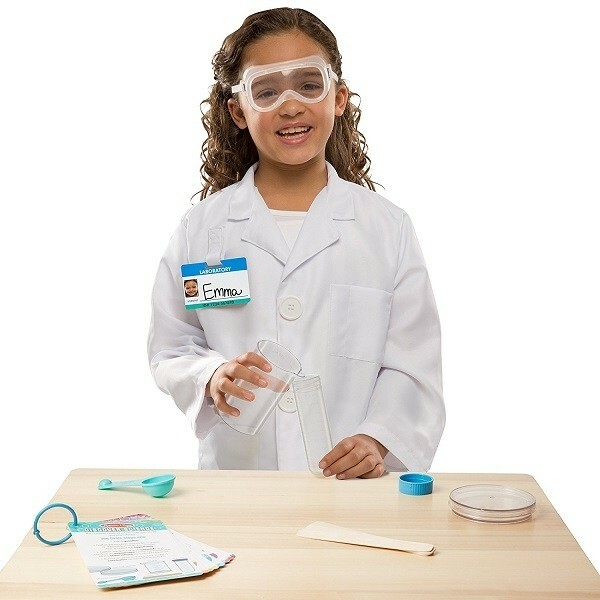 Discover great things with this scientist role play set from Melissa and Doug! An official-looking white lab with a reusable name tag is sized to fit little lab techs five to eight years old, and the lab goggles remind even budding scientists that safety comes first. As an added bonus, kids get a selection of real lab gear — including a test tube, a petri dish, measuring spoons, and more — for experimenting year round. Top secret! Don't let anyone know about this spy costume set from Melissa and Doug. 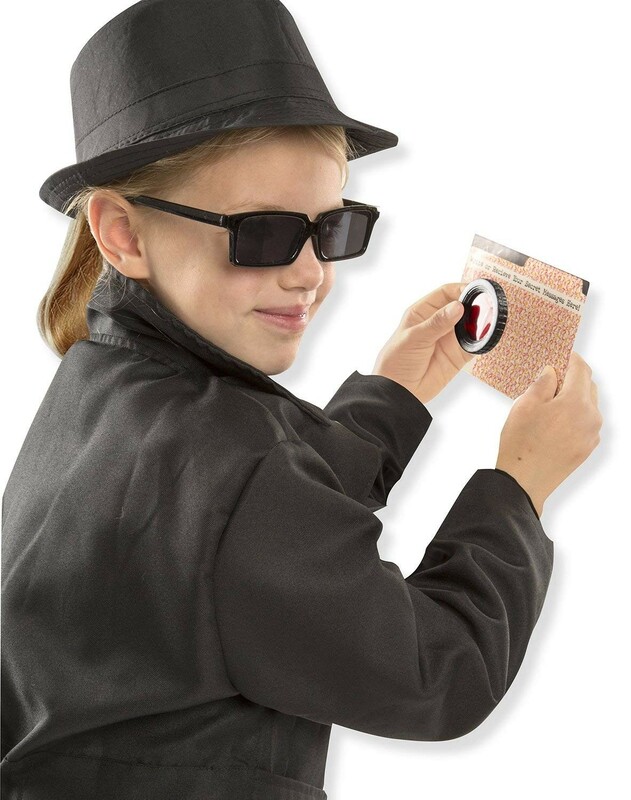 This costume set comes with a black spy jacket, a matching hat, and cool spy accessories like rear-view mirrored sunglasses, a coded secret message card, a decoder lens, and a spy guide. It makes a fun costume for a night — or a prompt for imaginative play for ages! 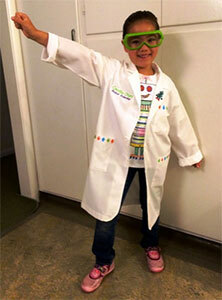 If she dreams of being a scientist or doctor — or conducts experiments in her spare time — this lab coat is perfect! Although it can be used as a costume, this is a real child-sized lab coat so can also be used for at-home experimenting. It's machine washable and features three pockets for all the equipment she’ll need for a busy day at work. Satya is five years old and loves animals. She was excited to carry around one of her stuffed animals with her on Halloween aka her patient. My daughter wanted to be a biologist for Halloween, specifically a "scientist who studies butterflies". She loves it and had so much fun helping me put it all together. We had a mother/daughter duo costume as Firefighters! 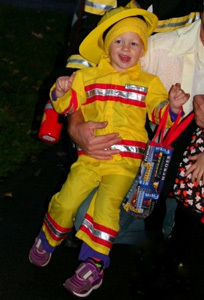 At age 2 1/2 Katherine didn't notice when people said "what a cute fireman'. My simple reply was "yes, she is a cute Firefighter"! Mighty Girl Power! Abigail (age 9) has attended camp Kennedy Space Center for 2 years. 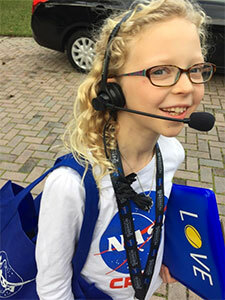 This year's costume is inspired by her dream job, Space Shuttle Systems Operator. Thank you a mighty girl for all the inspiration! Lyla - age 7. She decided to dress as her future self - a pediatric gastroenterologist. She knows exactly what this is because she's had one she's looked up to since she was 8 months old. 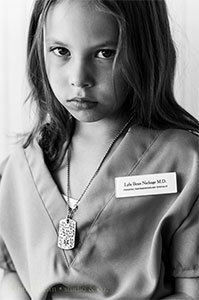 And, she can say pediatric gastroenterologist faster than most adults can say, "Doctor". Vivienne (2 years old) loves to see the big brown UPS truck when it pulls onto our street. And she loves our UPS delivery gal. 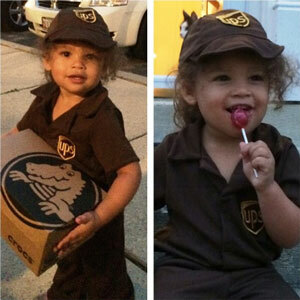 She insisted being a UPS worker and "delivering" candy to all the trick-or-treaters who can to our door. 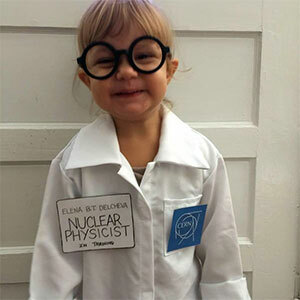 My 2-year-old daughter dressed up as a CERN "nuclear scientist in training"
Madison, 2 1/2 years old, loves looking at construction sites and points out all of the excavators we see! 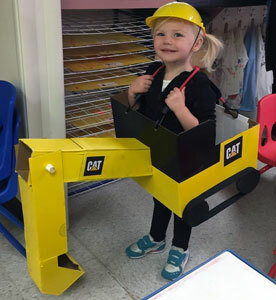 An excavator was the 1st thing she thought of when we asked her what she wanted to be for Halloween! 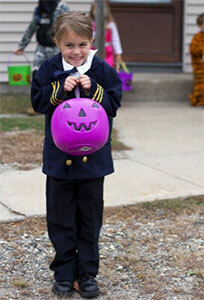 Isabelle, who is 5, choose to be a police officer for Halloween. We have a neighbor who is a Highway Patrol Officer. Isabelle also enjoys pretending to write her sister tickets for speeding on her bike. Cecilia, age 6, dreams of making and designing robots. She already has a full design sketchbook! She came up with this Robot Scientist costume all on her own, and she designed her own robot teeshirt, visible under her lab coat. As she says, "Robots are awesome, and they're for everybody! When I grow up I'm going to make them." You go, my wonderful Mighty Girl, you GO!